Sorry, these are out of stock and not currently available. 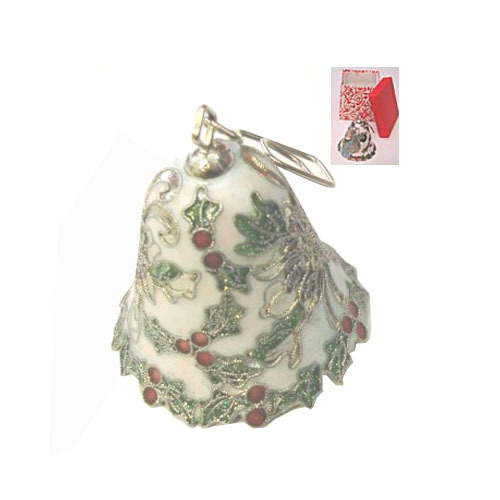 These lovely ornaments measure 1 1/2" x 2 1/4" and are presented in a quality gift box. They have a very pretty tone and will make a lovely Christmas gift. Cloisonne first developed in the Near East. It spread to the Byzantine Empire and from there along the Silk Road to China. Chinese cloisonne is arguably the most well known of all the varieties of cloisonne and enamel making. Presently, We have no two exactly alike. Most are white as shown but we have a limited quantity with backgrounds of light blue, pale yellow, red and green. Please select your preference when you add to cart.